Printers Maintenance Co. began in 1984 as a Michigan-based offset printer dealer. ATF Chief presses quickly became our specialty. Owner Jim Brigham began his first business at age seven collecting newspapers and magazines for recycling. By age 11, he was a newspaper carrier. Two years later he was employed at the delivery end of an 8-unit rotary newspaper press. During high school and college he worked nearly full time at various job shops and the graphic arts research department at Rochester Institute of Technology. After graduating with a Bachelor of Science degree in Printing Management in 1963, Jim worked 10 years as a supervisor for Continental Can Company, printing and coating sheet metal, including early development of dry offset and UV printing. In 1973 he returned to offset paper printing in a variety of in-plant and job shops. It was during this time that he realized in each of these past experiences, he had, in one way or another, been involved in machine repair. 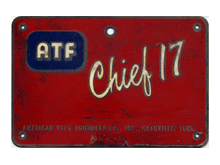 So in 1984 he began Printers Maintenance Co., buying and selling printing equipment, but primarily working with ATF Chief 15 and 17 presses. This lead to the development of many improvements to these presses, and he now provides service and parts to customers in all 48 states plus.